Today (12th August) is International Youth Day. 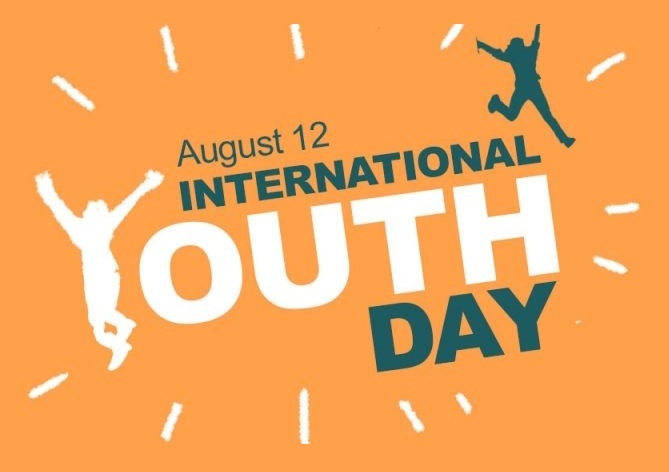 The first International Youth Day was observed on 12th August 2000 by United Nations. The purpose of this day is to draw attention to a given set of cultural and legal issues surrounding youth. Theme of International Youth Day 2018 : "Safe Spaces for Youth"
Today (12th August) is World Elephant Day. This is an international annual event, dedicated to the preservation and protection of the world's elephants. The Delhi Police today inducted an All-female Special Weapons And Tactics (SWAT) team, making it the 1st unit of its kind in the country. The 36 women, all from Northeastern states, underwent 15 months of training under the National Security Guard (NSG). The unit will be deployed when PM Narendra Modi gives his Independence Day speech at the Red Fort. Parliament has passed the Insolvency and Bankruptcy Code (Second Amendment) Bill,2018. The Bill replaces ordinance promulgated in this regard and amends Insolvency and Bankruptcy Code, 2016. As per the bill, home buyers will get due representation in the Committee of Creditors that takes a call on resolution proposals, making them an integral part of the decision making process. Union Cabinet has given approval for raising of 4 additional battalions of National Disaster Response Force (NDRF) to strengthen the India’s disaster response set up. These battalions will be placed in Jammu and Kashmir, Himachal Pradesh, Uttarakhand and Delhi National Capital Region based on their disaster vulnerability profile. The Union Cabinet also approved continuation and revision of Centrally Sponsored Scheme of Post Matric Scholarship for Other Backward Classes Students for studying in India (PMS-OBC) till 2020. PMS-OBC is flagship scheme of Ministry of Social Justice & Empowerment, in operation since 1998-99. Aim of this scheme : To provide financial assistance to OBC students studying at post-matriculation or post-secondary stage to enable them to complete their education. The National Aeronautics and Space Administration (NASA) today successfully launched its Parker Solar Probe, aimed to enter the Sun's corona (outer atmosphere), where no spacecraft has gone before. The mission will probe why temperatures in corona reach a million ºC while Sun's visible surface below it only reaches about 5,500ºC. The Parker Solar Probe is the first NASA mission to be named after a living individual, Dr Eugene Parker. In 1958, the 91-year-old American solar physicist predicted the existence of the solar wind, a stream of charged particles blasted from the Sun. He also theorised why the Sun's corona (outer atmosphere) is hotter than its surface below. Union Cabinet has approved extension of term of Commission to examine the issue of Sub-categorization of Other Backward Classes (OBCs) in Central List till November 2018. This is third extension granted to commission for submission of its politically crucial report on creating quotas within quotas. The five member Commission was constituted under article 340 of Constitution in October, 2017 with approval of President. Head of this Committee : G. Rohini (former Chief Justice of Delhi High Court Justice (Retd)). Pakistan and Russia have signed contract on admission of service members of Pakistan in Russia’s Military Training Institutes. The agreement was signed at conclusion of first meeting of Russia-Pakistan Joint Military Consultative Committee (JMCC), the highest forum of defence collaboration between both countries held in Rawalpindi, Pakistan. This agreement is considered as sign of further strengthening defence ties between Russia and Paksitan. Note : This will be for first time, Pakistani soldiers will undergo training at Russian military institutes. India's 3rd largest private-sector bank, Axis Bank became 1st bank in the country to introduce Iris Scan Authentication feature for Aadhaar-based transactions through its micro ATM tablets. The Lok Sabha has passed Arbitration and Conciliation (Amendment) Bill, 2018 to help India become hub for domestic and global arbitration for settling commercial disputes. It seeks to amend Arbitration and Conciliation Act, 1996 which contains provisions to deal with domestic and international arbitration and defines law for conducting conciliation proceedings. In it's recent report, the International Monetary Fund (IMF) has projected India’s GDP growth 7.3% in the 2018-19 fiscal and 7.5% in 2019-2020 on strengthening of investment and robust private consumption. Nobel Prize-winning author V S Naipaul (85), who was born to parents of Indian descent, has passed away. He was known for novels like 'A House for Mr Biswas' and 'A Bend in the River'. Justice Gita Mittal was sworn in as the 1st woman Chief Justice of Jammu and Kashmir High Court. She earlier served as a Delhi high court judge for 14 years, out of which 15 months were as the acting Chief Justice. She is known for her judgments on child abuse, disability, gender rights, environment, cleanliness. Rekha Sharma (54) was appointed as Chairperson of the National Commission for Women (NCW).